As a test I decided to use Sedo’s featured listing to see whether it helped offers or sales, it’s quite apparent they are not a broker in the sense that they would seek out a buyer for premium domains however they are the only real shop window so worth a test I felt. I don’t have a great deal of domains for sale, most are for development in one form or another but chose TVs.co.uk which Sedo had previously appraised at £22,000 for this test, 2 weeks ago I paid the €39 for a featured listing. When you order a Featured Listing for €39 your domain listing will rotate between the Sedo homepage and featured listings page for 30 days. Thirteen randomly selected Featured Listing domains are displayed on the Sedo homepage each hour while the remaining domains are displayed on the Featured Listings page. I have to say both bids were for $100, so unless it’s a really crappy domain, which I don’t believe then it would suggest this premium is likely a waste of money, Sedo upgraded the domain to a ‘Top Domain’ which probably accounts for the larger amount of page views on the sale page. What strikes me is why on earth would people low ball to the extent that they do on Sedo when making offers, I have had it numerous times on domains, offers like $50/$100 on domains clearly worth 4 figures, it’s not like most people using such a specific service as a domain marketplace would be blind to the value of their domains, maybe sending emails to owners but on a domain marketplace? If you can’t make a serious opening offer then your unlikely to get a serious counter bid. Around September 1st, pretty much when Google Images implement their image labeler my Google images traffic plummeted on my tattoo site. Unlike many others, I always benefited pretty well from the traffic that Google images supplied, probably because my site is image based, that traffic converted well into Adsense earnings and library subscribed members so I quickly felt the pinch. The traffic briefly came back and then flatlined, nothing on site had changed. 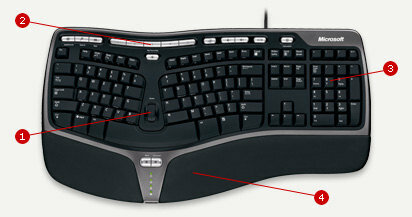 It has been an interesting week for me so far, I was feeding my daughter Eve and with no warning she managed to throw up her milk all across my keyboard, there was no saving it so I had to do some research for a new one, I wanted something that was ergonomic after last year when I changed to a vertical mouse which helped a slight RSI. I’ve mentioned in a few posts how I experimented with ClickBank last year, I never went into any great detail as it was one of those things that would of been really easy to duplicate. However I find you don’t see many real life example on how programs convert and as I’m not really pushing it any more I thought it would be good to share my findings and results. I am going to do an update on a little sideline project that covers a couple of points and posts that I have mentioned before. Last June while having a game of snooker with a good friend of mine Ian who runs his own joinery company, we talked about wanting to invest a bit of cash with each other into something different as a bit of fun and an experiment, a bit like those stock clubs you used to get which would give us a good reason if we ever needed it to meet up and chew the fat. All of the advertisements work in a similar way, they double underline relevent phrases on your page which when hovered over popup an advertisement balloon which includes an appropriate image and text which when clicked takes your visitor off to a suitable shop. 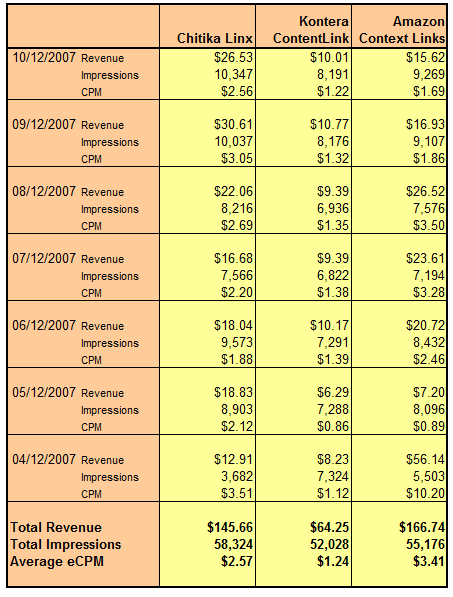 Both Chitika and Kontera pay you per click whilst Amazon pays you a commission on any thing that is sold. I set myself a goal for this Christmas season and that is to earn an extra $50K over November and December. To achieve this goal I’m using a few techniques that are new to me, so far some have been very successful whilst others proved a good learning experience. For obvious reasons I don’t want to share everything that I’m doing (probably will in the New Year) but I’d like share something I’ve been running for the last couple of weeks, it has broken even but I am certain with a few tweaks somebody could make a lot more out of it, I’m going to call this “The Coolest Blog Ads Experiment“. In my daily gadget search I came across what I think is a very cool product (in a “I’m a complete geek” kind of way), the Wi-Fi Detector Shirt, it’s an animated T-Shirt that, you guessed it, displays the strength of any Wi-Fi networks that you’re within range of. So I did the obligatory gadget post and earned a bit of commission by selling a few but it also got me thinking. This is on the subject of leasing domains and my previous post where I talked about becoming an internet landlord, if you remember that post I mentioned a domain I was going to test it out with, I had spotted replica weapons on Sedo and I had bought it for £261. I liked this product related domain. I know people like examples of sites and case studies so I am going to throw another one out there today, I bought a few sites & classified sites recently one of which is Boats4Sale which I intend to keep for the long term. 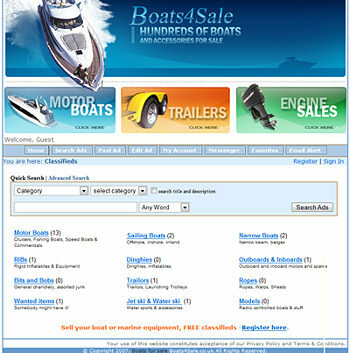 Boats 4 Sale was an old classified site that was built around the end of 2002.